RUSH: This is the most… The employment news, the jobs… It was good news. That’s all you need to know. The unemployment rate stays at 4.1%. The number of jobless claims — which I know sounds confusing for those of you in Rio Linda (it means the number of people applying for unemployment) — was way down below expectations. But that’s not the news. The Hispanic unemployment rate dropped to 4.7%. That is the lowest in the history of the United States. That’s 4.7% unemployment in the Latino and Hispanic population — and, again, that’s the lowest in the history of the United States. Couple this with the news that we have had all week that manufacturing jobs, the original number was 40,000, and I think it’s closer to 50, maybe 51,000 manufacturing jobs recreated. These are jobs which had been lost. They’ve been recreated, repatriated, remade here in the United States in the first 10 months of the Trump administration. The economy is just booming. The statistics here are undeniable. 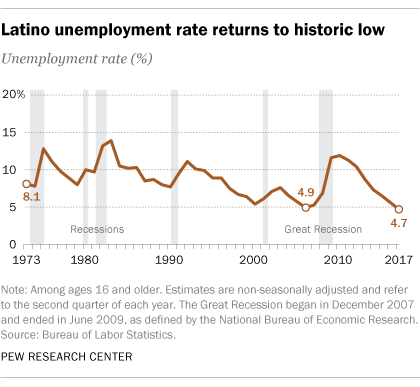 Why do you think the unemployment rate for Hispanics dropped to 4.7%? Again, that’s the lowest in the history of United States. Now, you compare that. The Democrat Party — and, for that matter, the Republicans — for the last 20 years have been doing competing handstands trying to convince Hispanics that they’re all for them by promoting amnesty by having open borders. And, of course, this didn’t lead to any good news on the economy, didn’t lead to any good news for the Hispanic community in terms of employment. So now we got a new sheriff in town, literally, and deportations are way up. Although it has been discovered that Obama had reported deporting something like 500,000 illegals, they weren’t deported. We’ll chalk it up to a clerical error. The point is that is a number that is as large as the population of Atlanta. That is larger than the population of Sacramento. That’s an outlier because deportations are way up, and the numbers of illegals attempting to get into the country is way down. I mean, the things that have taken place and the dramatic changes that have occurred, the sad thing is that 90% of the American people that watch the news media don’t know any of this. Because they watch the Drive-By Media, the Drive-Bys are not reporting any of this. Of course, the Drive-Bys are only reporting that Trump is a scoundrel and he should resign now that Franken has resigned and the collusion with Russia and all that. The news here is dramatic no matter where you look at it! I mean, 4.7% unemployment the Hispanic community. You know, I’m really confused here because I had this story right in front of me, and it’s not here. But here’s the next one I’m looking for: “92% of Democrats Uninformed.” This is the… What is the polling data, the company? CBS News. “A new poll released this week by CBS News found that 92% of Democrats believe Trump advisors had improper dealings with Russia.” Only 6% of Republicans believe that. That is an illustration, when you get right down to it, of just how bad and weak mainstream news reporting is: “92% of Democrats believe Trump advisors had improper dealings with Russia.” There isn’t any evidence of this. There hasn’t been a shred of evidence found. In fact, the evidence that keeps being discovered illustrates quite the opposite, that it’s the Democrats and Hillary and the FBI that were having all the illicit contact with Russia. We had a blockbuster yesterday about a guy in the DOJ, and there’s more news on that today, which we’ll get to in due course. But slowing the rate of illegal immigration has to be helping the U.S. economy, and it has to be helping U.S. citizens. It may hurt Democrats and vote fraud schemes and so forth, but it is helping American workers. Flooding the workforce with illegals suppresses wages, and the numbers of illegals even trying to get into the country is way down. Now we have 4.7% unemployment in the Hispanic community. I think that’s incredible. GatewayPundit: Trump Jobs Numbers Out: Unemployment at 17 year Low, 2.2 Million New Jobs Since Election, More Americans Working than Ever! CNBC: November Nonfarm Payrolls Rise 228,000 vs. 200,000 est.